I currently own a couple of intel xeon platinum engineering samples (the label on them is QL1K). 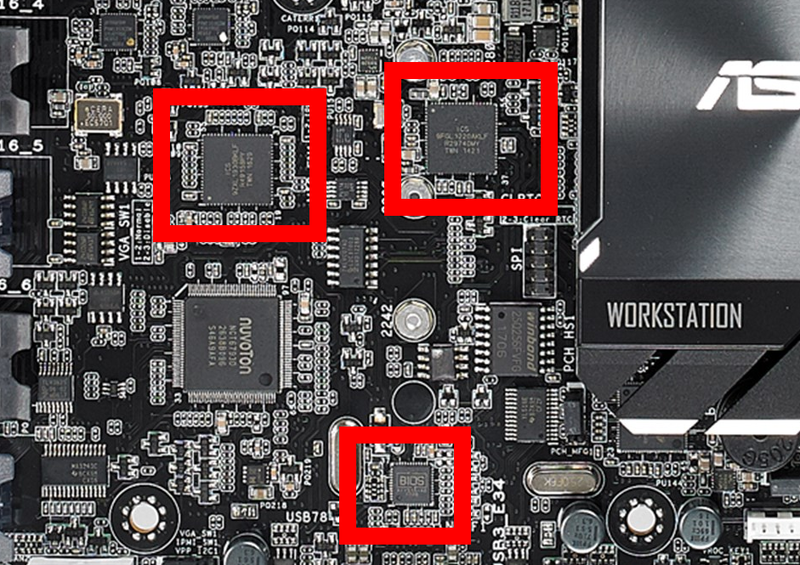 Because of this, they won't boot up on the Asus WS C621E Sage but they will boot on some other motherboards such as the Supermicro X11DPH-T (I own both but would like the C621E to work since it has some extra features). Is it possible to mod the bios on an Asus WS C621E to allow these chips to boot? Currently on initial boot it gets stuck at post code 04 which is PCH initialization according to Asus' documentation. Now if I hit the reset button at that point it'll cycle through some codes and end with 66 and one long beep followed by two short beeps which indicates a memory error (tried memory in all slots and the memory does work on the supermicro board). I helped them test updated (Actually older) microcodes versions used in a known working motherboard (X11DPH-T) in this board w/ those CPU's, no change. Hope you can help @DeathBringer Due to risk, I advised them not to try the ME transferred (Direct transfer, and settings only transfers) BIOS files I've made them, until they had the SPI header cable in hand and were able to get verified backups with programmer. I've sent them on Asus hunt to multiple forums, social etc trying to nudge out some official help too, no luck yet. Here's a screenshot of the CPU and Mainboard tabs on the Supermicro X11DPH-T that Lost mentioned. Unfortunately I don't have any CPU's that work with the Asus WS C621E that I can use to fully boot with. Do you need any other info? Make current BIOS backup of your WS C621E SAGE with hardware programmer. That is our holdup currently, the BIOS is QFP, waiting on SPI header cables (And confirmation from Asus if SPI header pinout is similar to Z370 boards) to attempt backup via header. Hi, I am new here and I am wondering if someone can help me I have bought an ASUS WS C621E Sage and am looking for some ES CPU advice. I have seen people like Linus run ES or QS on the board, so am wondering if I would need a special bios to allow me to do that or is there an established list of ES cpus which have been tested and known to work with this board? I have my eye on a genuine bronze CPU for about £200 but I would like to spend less by going the ES route if thats possible. You're welcome, tag (@name) some of the users you see posting in that thread, or all of them, in a new reply, then they'll all get a message that you posted your question.